Your team of Divers are on a mission to save the fragile ecosystem of DiverCity by convincing the government to turn it into a national park. It’s a beautiful archipelago with multitudes of species coexisting in a vibrant tapestry of life. Not everyone can appreciate this place for its beauty alone. Multitudes of corporations attempt to exploit its natural resources and coral reef. If you succeed, the coral reefs will thrive and grow for years to come. If you fail, the Archipelago will become an over-exploited wasteland, void of life and beauty. In Mini DiverCity, divers work together against corporations to save archipelago from ecological ruin. All players win together by saving a set amount of species. Maxime Tardif designed Mini DiverCity, and Sphere Games publishes it. 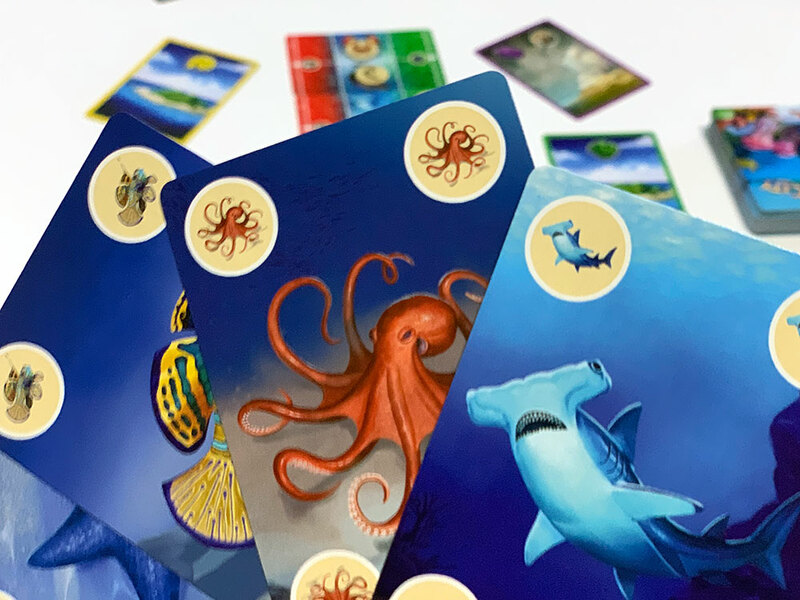 Each player receives a diver card and three (face-down) Species cards. On the table, we set up a Species deck, a Corporation deck, and a Species Survival scale. 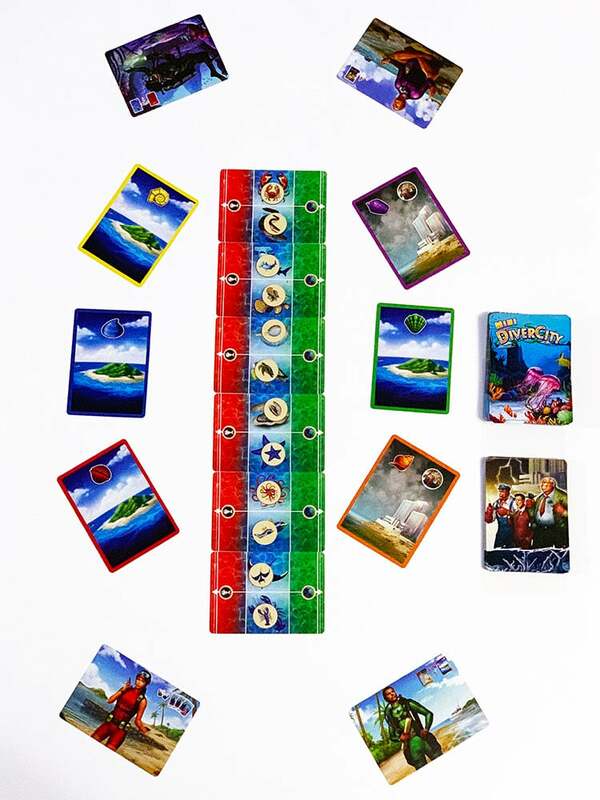 Six island cards surround the Survival scale. Important to note, you don’t look at your cards unless an action in the game allows you to. Turn over a corporation card to start your turn, and immediately apply its effects. There are three types of corporation cards with their own consequences. 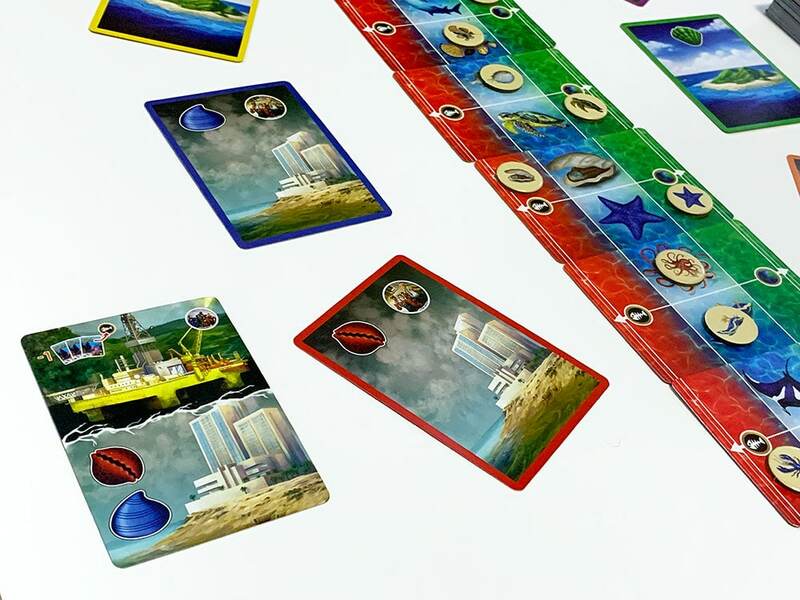 The Oil Platform forces the active player to blindly pick a species card from their hand to discard. When discarding, reveal the Species and move the matching token on the one space towards extension if not Extinct or already Saved. Draw a new species card. 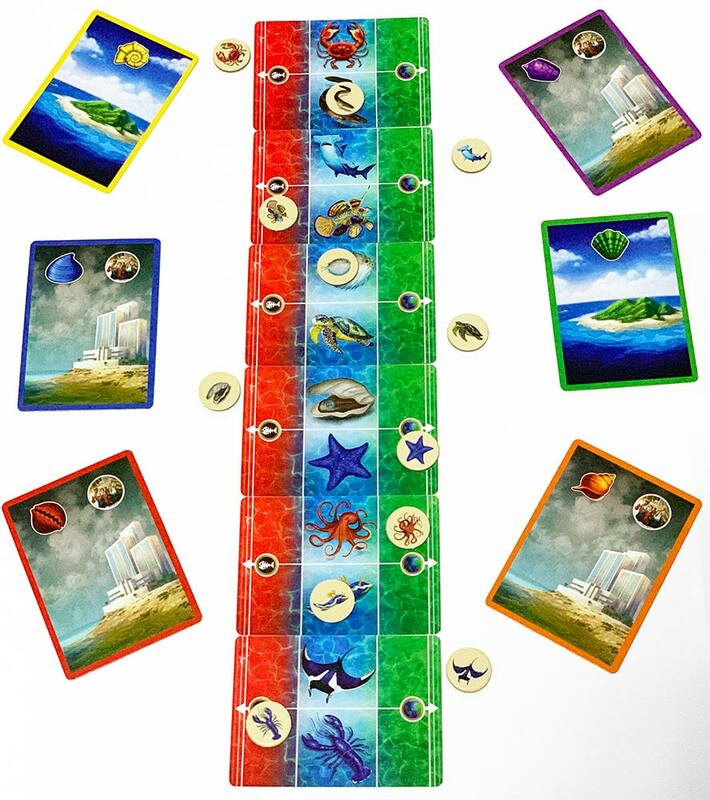 Dynamite Fishers causes the player to flip over the top card on the species deck and discard it. If not already saved, move the corresponding token one space towards extinction. The Hotels flip over island cards to become hotels as depicted by colored sea shells. If a hotel side is already in play leave it be. To play a Species card, select one from your hand without looking and place it face-up on the table. Move the corresponding token one space toward Survival; then discard and draw new Species card. Use your Walkie-Talkie to tell another player all the Species cards in their hand. This is the only direct information that you are allowed to share with others during the game. Close down a Hotel. 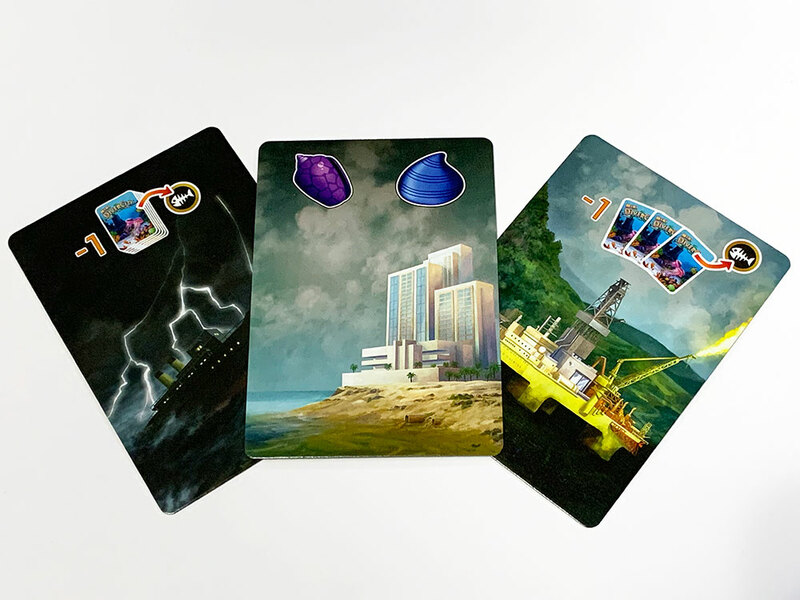 Discard a species card and flip over any hotel back to its island side. Player draws another species card. Diver cards grant each player a special power that can only be used once per game, anytime during their turn. 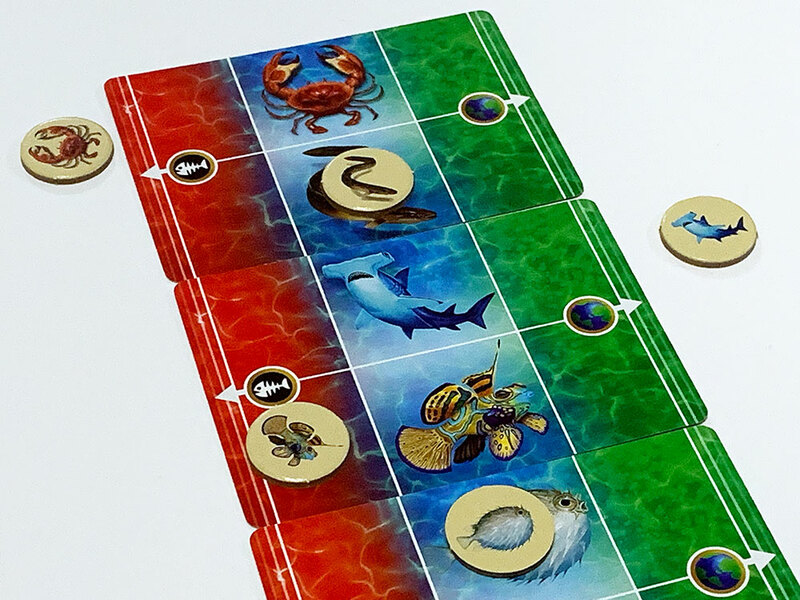 The Environmentalist flips over a hotel card, Explorer allows you to look at your own species cards, and the Endurance Specialist can move one species token from the red column to the central blue column of the species scale. Players cannot strategize nor communicate together unless a Diver card power allows it. Play continues until the rescue goal is met to win. Players lose if corporations kill off too many species, all six hotels are built, or the species deck runs out. Mini DiverCity is a cleverly crafted co-op card game that’s packed with gameplay options. It works just as well at many player counts and offers interesting variants to keep even seasoned gamers at the edge of their seats. Each turn ushers meaningful decisions that will contribute to the success or failure of the team. The flip of a corporation card that builds two hotels could leave divers with one island remaining. Do you push your luck to rescue a species and hope the remaining hotels don’t flip next or play it safe and restore an island? The zero-communication rule sets Mini DiverCity apart from most other co-op games that allow players to discuss strategy real-time. With younger players this can be challenging, however Diver abilities and the Walkie-Talkie action help mitigate this. Not being able to see your species cards is what makes the game most challenging and thrilling at the same time. In many instances playing wrong species card isn’t the end of the world, as you might still move an animal closer to safety. The anticipation of playing a card blind is exciting; you’ll either gasp in anguish or fist bump your fellow players as you rescue a hammerhead shark from extension. One of the most compelling elements of Mini DiverCity is the theme itself: ecological conservation. It creates the perfect setting for a tension-filled co-op experience, where divers work to thwart the efforts of greedy corporations. Playing can lead to meaningful discussions about the importance of conservation and protecting animals from extinction. The manual assists these conversations with facts about the creatures that appear in the game and Jacques Cousteau. Mini DiverCity is easy-to-learn, surprisingly challenging, and offers a variety of gameplay in a small box. As my kids grow, so can the difficulty of the game. It’s perfect for families, serious gamers, and those rogue solo players. I look forward to mixing in variants with different groups of players in future sessions. Find Mini DiverCity on Amazon for about $20, or ask for it at your friendly local game store. The Family Gamers received a complimentary copy of Mini DiverCity from Sphere Games for this review.